There is a place, an actual physical place, where writers, book artists, and publishers work, create, and collaborate together. It’s a place where books can literally go from the mind to the page, to the bookshelf. This place is called Open Book—a gem of a literary center located in Minneapolis, Minnesota. 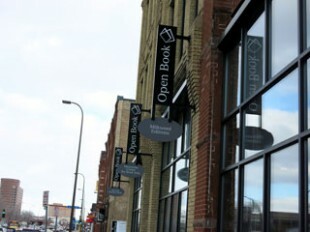 In a space created from three 100-year-old buildings, three nonprofit literary organizations came together to open a collaborative center for the literary arts: Milkweed Editions (a publishing company), The Loft Literary Center (an organization devoted to the development of writers and literature), and the Minnesota Center for Book Arts (responsible for the physical creation of book art). The space breathes literary collaboration. 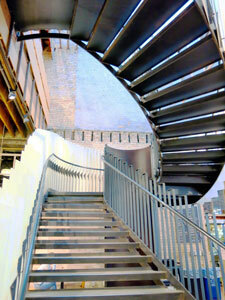 JJ’s Coffee and Wine Bistro welcome visitors as they walk in the door, and just behind it is a spiral staircase with long, narrow pages of brilliant white paper running up one handrail. Faintly inscribed on the pages are poems, or pieces of poems, words, and snippets of paragraphs all lined up one after another until the staircase meets the top. At the top of the stairs sits The Loft, a literary center brimming with workshops, author readings, and other literary events. Pockets of people sit quietly in chairs, reading books or pages of manuscripts. Walter Sigtermans is waiting for his writing group: six people who have been meeting for seven years to share their writing and their lives with one another. Open Book is the ideal place to meet, Sigtermans says. The rough, stone walls and rugged support beams lend themselves well to the imaginative spirit. Remnants of the old buildings still remain: stairs leading to nowhere, a mysterious security vault door, and the open seams where separating walls were torn down to create more open space. “It’d be a great scene for a murder mystery,” Sigtermans says. Jennifer Lorge sits down, greeting Sigtermans like an old friend. The group has been meeting so long their time together isn’t just about writing anymore. They’ve forged deep bonds, Lorge explains. “We’re growing old together,” she says. One year, shortly after her husband died, Lorge and another group member decided to exchange a poem every day for a year. It was therapeutic and artistically challenging. “It was a fabulous year,” says Lorge. 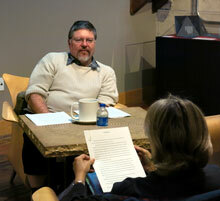 The group met by taking a writing class offered by The Loft. The Loft offers around 400 adult classes and 100 youth summer classes each year taught by 200 teaching artists, according to Chris Jones, marketing and communications director for The Loft. “It’s a growing, vibrant program,” says Jones. Meeting at Open Book every week gives the group a chance to know what else is going on in the building. Sometimes a Milkweed Editions author is doing a literary reading. Sometimes it’s a networking event for writers and editors. Other times they’ll see children in long lines coming to learn the art of papermaking downstairs. Milkweed Editions is on the third floor of Open Book. 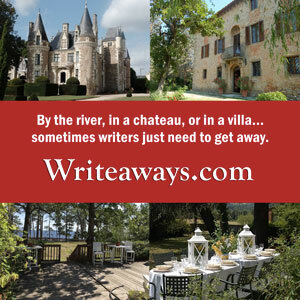 This independent publishing house publishes 15 to 20 books each year: fiction, literary nonfiction, and poetry collections. Their space includes an area where the public can peruse Milkweed’s entire library of publications. “Publishing is sometimes a forgotten art,” says Jones. Since 1980, Milkweed’s books and authors have received hundreds of awards, including three Lannan Literary Awards, three American Book Awards, and seven New York Times Book Review Notable Books of the Year, according to the Milkweed website. 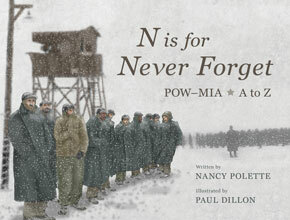 Thirteen of its books have also won the Minnesota Book Award. The art of book making is front and center on the lower half of Open Book. 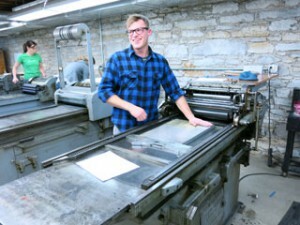 The Minnesota Center for Book Arts (MCBA), now in its 27th year, deals with the arts of paper making, printing, and book binding. “We come from a long millennia old tradition,” says Curt Lund, marketing and communications manager for MCBA. MCBA has equipment and materials for hand-making paper, drawers and drawers of wood and metal type, and printing presses—primarily for letterpress printing. The physical book making takes place in the basement—what some call the “dungeon” because of its crumbly stone walls and arched doorways. Book artists can pay a daily fee to use the equipment, or they can join the artist’s cooperative and pay monthly for 24/7 use of the space and equipment, Lund said. Laura Brown, a printmaker and member of the co-op, comes to do her work here because owning and storing a printing press would be costly. “I get to be a part of a great community, too,” says Brown. One of Open Book’s greatest assets is the community it creates for artists. Professional artists aren’t the only people who benefit from MCBA. Anyone can take a class to learn about the book arts. There’s even a summer workshop for kids that involves writing a story—with help from The Loft teaching artists—and printing and binding it on paper they make themselves. As artists emerge from the printers’ dungeon and leave Open Book on a warm summer evening, they may hear the strains of a violin and the laughter of a writing group coming from an outside balcony. “Did you know we have a fiddler on the roof?” Sigtermans says with a grin. All photos by Naomi Krueger. Naomi Krueger is a freelance writer and avid reader of books, blogs, and tweets in Minneapolis-St.Paul. Contact Naomi.